She was projected to become a floating restaurant, hotel and nightclub on a sunny Caribbean island, but Hurricane Hilda sank all the plans…including the ship. The City of Richmond, a beauty in her day, sailed the Baltimore, Maryland, to Norfolk and York River, Virginia, route for 49 years. One of the Baltimore Steam Packet Company’s passenger/cargo carriers—dubbed the Old Bay Line—she was succumbing to faster, cheaper transportation, rising costs and the fading romance of early steamship travel. The 277-foot steel hull liner accommodated more than 300 passengers on three decks and assorted cargo on two others. 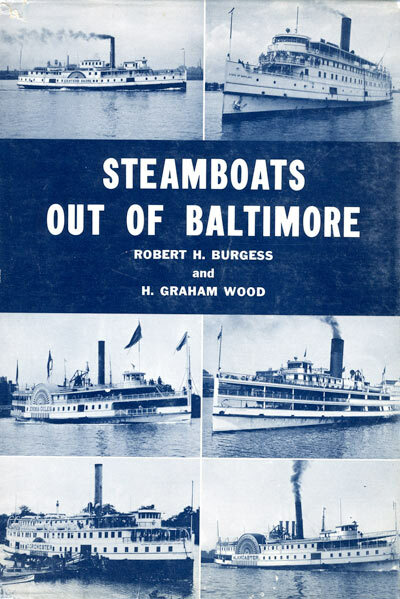 She and many more including: the City of Norfolk, the City of Annapolis and the District of Columbia served the Maryland, Virginia and Washington regions in days when steamboat travel was fun and fanciful. In addition to passengers and cargo, they carried packets of mail on overnight voyages scheduled 365 days a year. Many fond memories remain for those who were fortunate enough to have sailed aboard one of these Belles of the Chesapeake. Idle at the dock for more than a year, the forerunner of the Old Bay Line was sold in 1963. She left Baltimore on August 13, 1964, with a crew of six, spent three weeks in Norfolk and resumed the journey to St. Thomas, U.S. Virgin Islands, on September 23. Delayed again when the tugboat Sea Eagle broke down, the liner took refuge at Morehead City, North Carolina, until another tugboat, the Carville, took over. The vessels departed the Tar Heel State on October 3, but the trip ended two days later when they ran into strong winds and 10 to 14 foot seas lingering from Hilda, a category four hurricane that had just ravaged the south. Unable to withstand heavy gusts and a leaking bilge, the 1,923-ton steamer heeled to its port side, a cue for all aboard to abandon ship. The crew made it safely to the Carville and watched the ship sink to the bottom of the Atlantic 12 miles off the coast of South Carolina. Struggling, yet chugging along, the tugboat and survivors found a safe harbor in South Carolina. By the next day, a 20 foot section of the liner’s stack was no longer visible poking through the surface. The owner filed notice of abandonment and the site soon became an underwater habitat and divers’ haven. Sunk in 50 feet of water, the pride of the Old Bay Line sat upright at first, but gradually flattened out by beatings it took from storms and undertow. Wendell Patton, an accomplished east coast diver, told tales of the wondrous artifacts he salvaged, all evidence of the owners’ culinary plans for St. Thomas. Plates, cups, saucers, silverware, pitchers and glasses littered the sandy bottom. Pots, pans, roasters, deep fryers, ovens, mixers and utensils remained crated in the cargo holds. Salvage divers had a field day until the superstructure buckled and sand engulfed the goodies on the scatter trail. Soon spearfishing fans and photographers took over on what became one of the Palmetto State’s most prolific shipwrecks. Today, thousands of silversides, glistening in the 30 to 40 foot visibility, swarm over the wreckage. Nassau groupers hide in cargo holds and colorful tropical fish dupe divers into believing they are in Florida or Caribbean waters. 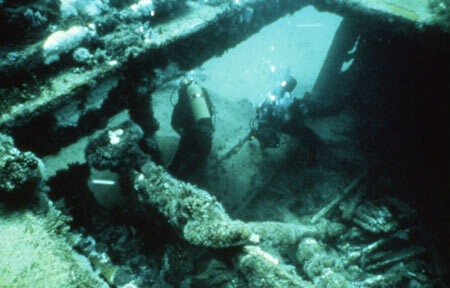 Blue angelfish, queen triggerfish and Atlantic spadefish circle over the superstructure where the three wooden decks have collapsed upon the two steel ones. Amberjack circle the perimeter while barracuda hang motionless nearby. Dusky and sand sharks visit the wreck accompanied by clinging remoras sponging free rides and leftover meals. Although battered and time-worn, some remains are recognizable: cables, winches, anchor chains, stanchions, boilers, beams, ribs, kitchen tiles and a steam engine are scattered over the bottom. A small space—perhaps storage room—is penetrable, but the bulkheads and other passageways have collapsed. The tip of the bow slants to one side in the sand, encircled by schools of mullet and blue-striped grunts. Coral colonies, blanket sponges and sea anemones cling to the remains of the keel. The City of Richmond remains a healthy ecosystem supplied by enough sunlight and nutrients to support a thriving community. The wreck is exemplary of something good evolving out of something bad as it provides a happy home for marine life, while remaining a perpetual divers’ delight. Note: Charterboats, operating out of Myrtle Beach and Georgetown, take divers to the City of Richmond and other wrecks offshore. Capt. Andrew Raak, of Express Water Sports, pilots the 46-foot Scuba Express for Express Water Sports, Murrell’s Inlet, Georgetown. Custom built especially for diving, the Newton model accommodates up to two dozen divers for trips scheduled March through October. For details go to: www.raakbottomimaging.com. A fascinating account of the end of an era. There are so few examples of these graceful steamships operating today. Thanks for sharing this story. Thanks for your kind words. This was an interesting wreck to research. 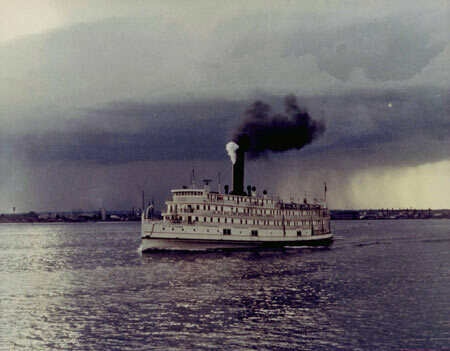 The Old Bay Line launched some beautiful steamships. I regret never traveling on one of them.